We thank you for considering our massage school. We have been training individuals in the science and art of massage therapy since 1979. In this time, we have created a convenient, affordable alternative to traditional vocational schools and community college programs. Our program is designed to assist people with active lives outside of school succeed in obtaining their massage license. For complete information on our program, download our Program Catalogue from the link below. 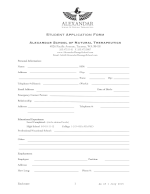 You may also download our application if you would like to apply for school. Would you like to contact our school advisor?